With too little waste being recycled, the Scottish Government should introduce a bottle and can deposit-return scheme, writes Kezia Dugdale. Climate change and the environment have been high up the news agenda over recent weeks and both Westminster and Holyrood parliaments have seen radical environmental protestors pull eye-catching stunts to raise awareness of their campaigns. Whilst I’m no fan of their methods, the sentiment behind the protests is right. 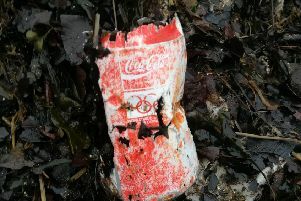 Last week, litter-picking volunteers on Cramond Beach found a 31-year-old washed up Coca-Cola can which featured a promotion for the Seoul Olympics, just one of more than 400 items collected by the group. Half the litter found was made from plastic and around 100 wet wipes were also washed up. That Coca-Cola can alone should serve as a stark warning. It’s possibly older than the parents of thousands of school children across Scotland who have been inspired by climate change concerns to stage rallies and protests outside their school gates. If we don’t start taking climate change and our environment seriously, what future awaits them? Scottish Labour introduced the first recycling targets in 2003, when Scotland relied on landfill for 91 per cent of its municipal waste, with deplorable levels of recycling at just four per cent. Today as many as 16 million plastic bottles still go unrecycled in the UK every day and the average household recycles just 270 of the 480 plastic bottles they use a year. Addressing the environmental crisis requires a transformational effort from government, and that this is not a task for tomorrow’s leaders, but one that requires urgent interventions. The Scottish Government should now introduce a bottle and can deposit return scheme, where people claim a refund against used drinks bottles, a small change towards securing a greener future. We have now nearly reached the end of Lent, a time of reflection and abstinence before the celebrations of Easter. The 40 days of Lent represent the sacrifice and struggle of Jesus in the desert, with many Christians using it as a time for prayer and penance. It is more common these days for Christians and non-Christians alike, to surrender a particular vice such as chocolate or alcohol, basically to sacrifice the good stuff in a period of self-discipline. Many others use it as an excuse to enjoy a digital detox, get fit, or be kinder and more understanding, something lacking from many involved in the ongoing Brexit situation. My own personal commitment over Lent has been to say thank you more, something potentially as challenging as going off their favourite tipple. To those who have decided to go off alcohol, firstly well done, and secondly, I have just the very person to help you, come the obligatory sore head the next morning. Saint Bibiana is her name, preventing hangovers is her game. This virtually unknown saint must have her work cut out come the end of Lent. Whether it’s a chocolate Easter egg or a glass of wine you are enjoying on Sunday, it is important to reflect on the significance of Lent, even if you didn’t take part. Lent is there to shake us from our lethargy and think about making the world a better place. So good luck in keeping up the promise of Lent – and don’t forget St Bibiana.